Home/I lost my histones…. what does this mean? We recently under took a series of phospho proteomics screening projects with Dr Chris Tape. This was to examine the very changes to phosphorylation signalling events in fibroblastic reticular cells when in contact with dendritic cells, and has given us some very interesting hits which we are now working with. 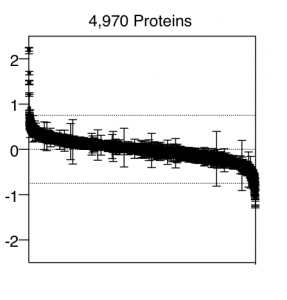 We expected no changes to the total proteome, and would use the proteome to measure changes in phosphorylation against. However, at just 15 minutes stimulation, we saw a loss of histone proteins, many different histones. Now since histones are very stable proteins, and the cells are still living, in fact these changes are reversible at later time points, we don’t think they can be being degraded (but tell me if you think that’s incorrect). In which case, are they missing from our analysis because they are now insoluble?